How we chose the most important piece of jewelry in our life. 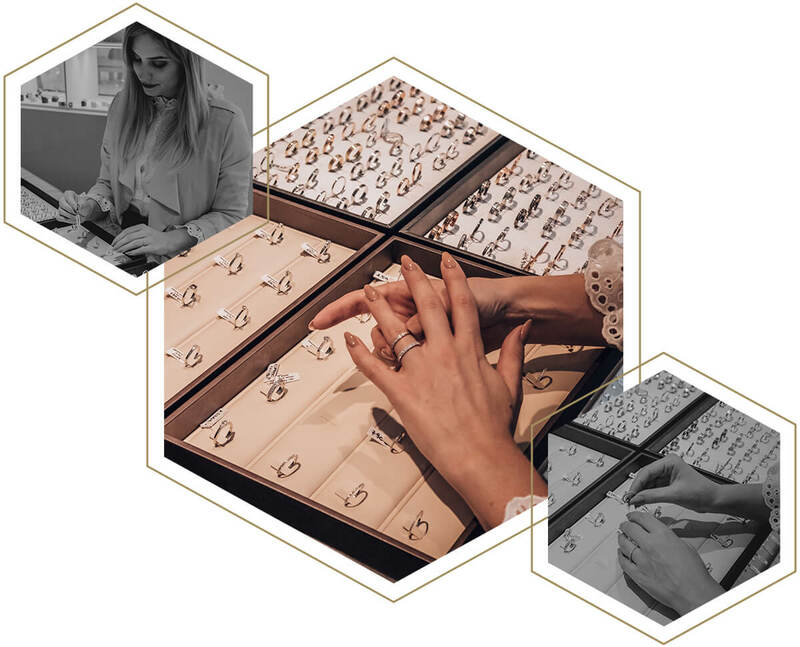 Choosing a wedding ring is a serious but wonderful task. 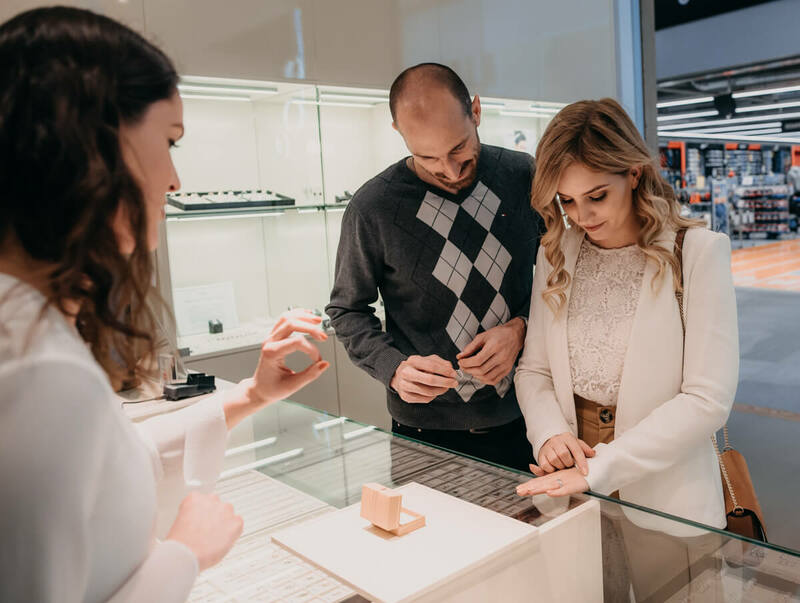 Although it is just a piece of jewelry, it is at the same time (at least the usual) fashion accessory, which is worn the longest by a husband and wife – or, ultimately, two women or two men. With the choice of the engagement ring, Jan really hit the jackpot – I really don’t know if I could choose a better one. It currently is the most important and definitely the most expensive piece of jewelry in my life, but will soon be joined by another ring that will become its matching pair in some sort of a logical sequence. In fact, both Jan and I already chose the wedding ring. We just picked them up at Zlatarna Sterle and we couldn’t be more satisfied. There are still a few months left to our wedding, but I’m happy to be ticking another one of the important choices off of my list. Before saying “yes” to your wedding rings, read the tips below. My heart, or better said my eyes, wanted the eternity band, that is, the wedding ring with diamonds. When doing a research on one of the American wedding forums (if you ever stumble upon one of these forums, the wedding there is taken super seriously), I became even more confused when reading the differences, the weaknesses and the advantages of a different clamping of diamonds – prong, pave or channel? At first it all seemed very similar. Because this is a very expensive piece of jewelry, I didn’t want to make a wrong decision. I did not know exactly what to choose until Jan and I visited Center Vič and out of curiosity paid a visit to Zlatarna Sterle. There I reconciled myself that the “prong” fit of diamonds is a good choice if the ring is made correctly, that it does not really get stuck. I fell in love with the ring in a second! And yes, I am aware that this statement sounds extremely materialistic. But for me, the wedding ring is more than just jewelry that I will wear for the rest of my life. The vast majority of eternity wedding rings found in Slovenian jewelries have diamonds spread over half of the ring, but in the US there are far more full eternity rings with diamonds around and around. I consider the latter version much more beautiful, especially if the ring rotates. However, there is a bad side to it – such ring can not be enlarged or decreased in size, and it is not possible to add engraving on the inside of the ring. We made a compromise of an eternity ring covered by diamonds by two thirds. 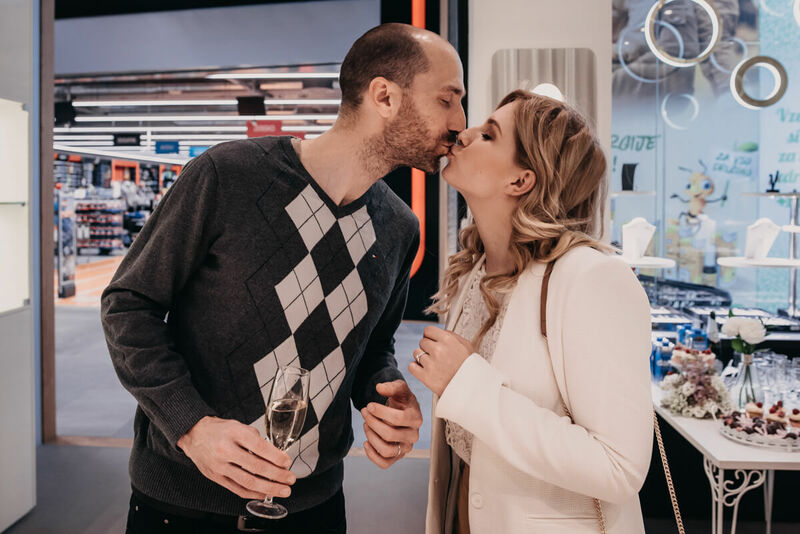 When we were first trying on our wedding rings, I really enjoyed it, even though we passed by the jewelry completely without expectations and only out of curiosity. 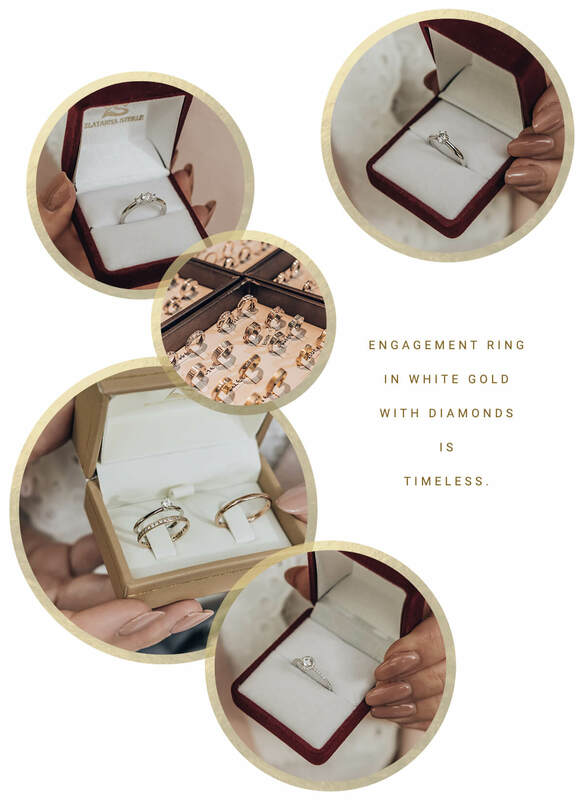 We were immediately convinced by a wide variety of choices, the quality of materials and the fact that you have an option to personalize or change practically any ring there according to your wishes. 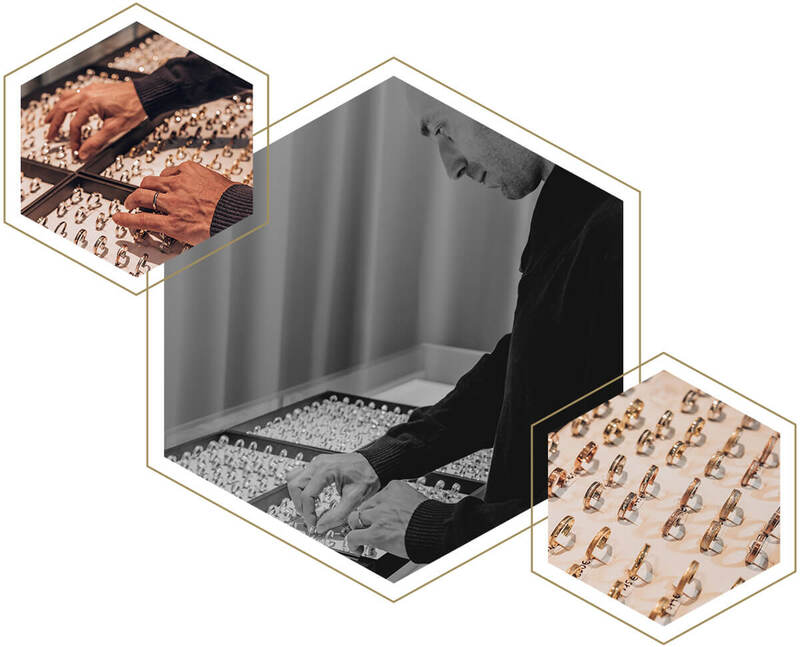 Rings can be made entirely by your taste – which is not the case with many Slovenian jewelries. The shop assistant at the Zlatarna Sterle in Center Vič was pleasant, professional and she shared a lot of tips and tricks with us. 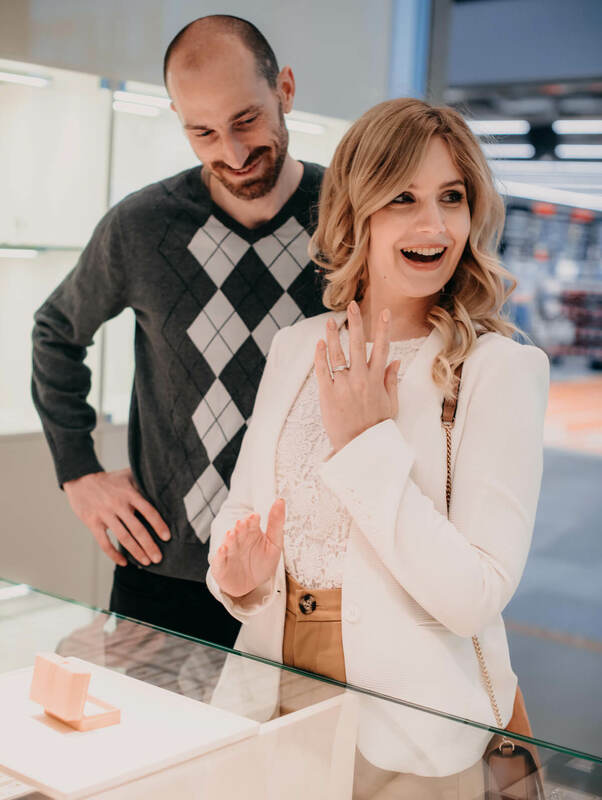 Our excitement just grew with our second visit to Zlatarna Sterle at Citypark, where we finally made our last decision and made measurements of ring sizes. To my surprise, Jan really enjoyed choosing not only his, but also my ring. Indeed, I advise all future brides and grooms to do this part of the wedding planning together. It was a really precious moment for us, even if this sounds a little bit cliché. Wedding rings are a symbol of eternal love and dedication, a symbol of an agreement between the two to spend the rest of their lives together. The circle symbolizes an eternity and is worn from the time of the ancient Egyptians (with the exception that at that time, the wedding rings were made from plants that grew along the Nile River). Tradition has been kept to this day, but has changed its form slightly. In some occasions, only a bride got a wedding ring. In some places around the world, the future bride should buy a wedding ring for a groom and vice versa. 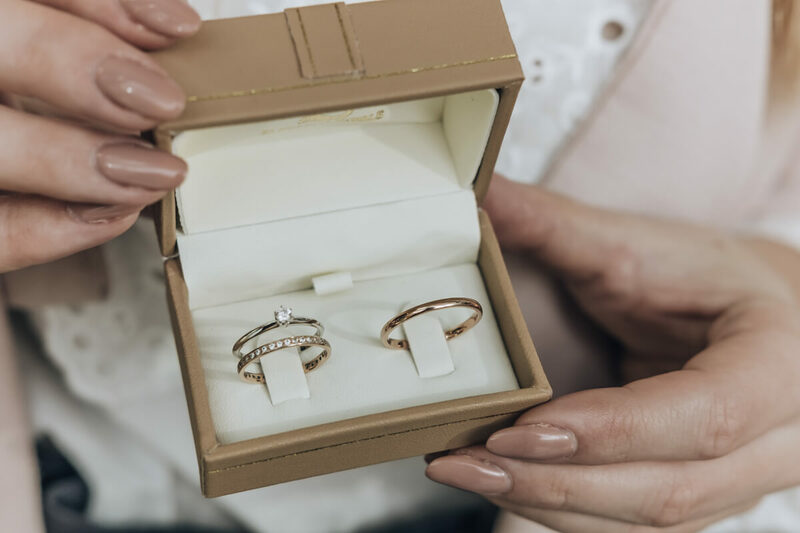 Today, many claim that by tradition, the wedding rings should be bought by the best man and the maid of honor, but most of them still decide to buy the wedding rings themselves. Where should the wedding ring be worn? And the engagement one? In Slovenia, we are unified in the opinion that the wedding ring should be worn on the left ring finger. But it’s not the same around the world. Almost certainly this is a remain of tradition or thought of ancient Egyptians and then later on ancient Greeks and Romans as well, that from this finger Vena Amoris (the vein of love) leads to the heart. The opinion to where the engagement ring should be worn are more divided. I wear it on my left finger, and it will stay there until it will be joined by my wedding ring. When to buy the wedding rings? Not too late. It is recommended to buy or order them at least 2-3 months before the wedding. 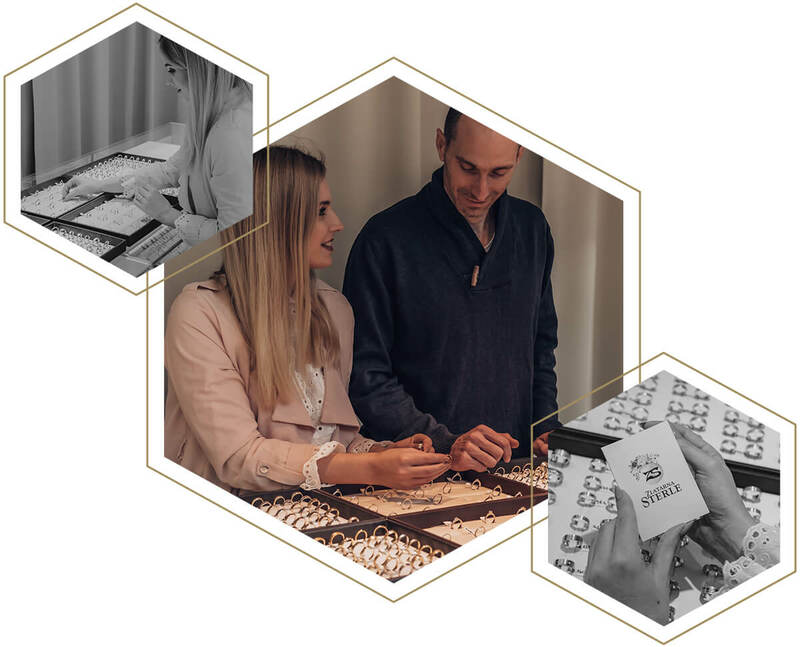 Unique rings, custom-made, and all types of personalizations (engravings or inscriptions with small diamonds), usually need at least a few extra days. How to save when buying wedding rings? At wedding fairs, check if the jewelry offers a discount. Yellow and white gold, platinum, diamonds and other precious stones are the most common elements of wedding rings. Of course, they are not the only option, the variety of choices is endless. For the last few years many chose a trendy pink gold, some even opt for a steel or black “coating” with a rhodium. The most common choice nowadays is white gold and diamonds. This is a crucial point for me. Fortunately, my engagement is ready for an addition of the wedding ring, because the stone is positioned so that the wedding ring can be placed very close to it. 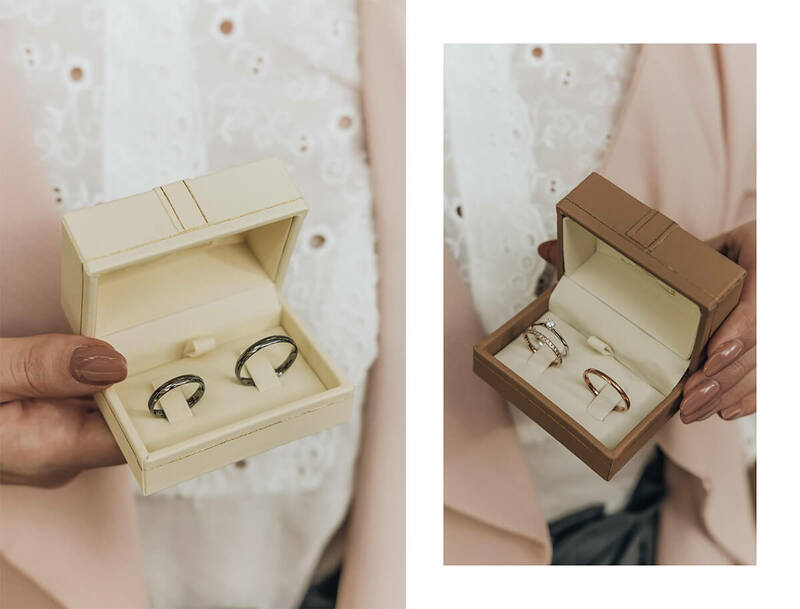 A tip for all the men reading this post (targeting the ones who haven’t bought an engagement ring yet but are planning to) would be to find out what kind of a ring your darling wants and, if possible, make sure that she’ll be able to wear it along the wedding one. There is nothing wrong with buying the engagement ring together. This is quite usual in the US, thanks to which the future bride gets exactly what she wants. It is advised that the engament ring and the wedding ring are made of the same material, not only because this way they will look as a whole but also because in that way the materials don’t get worn out so easily. Are you more into classic pieces or trendy ones? Are you a fan of minimalism or would you like something more noticeable? The style you choose will reflect your personality, so choose wisely. The wedding rings should be selected with respect to your lifestyle, work and hobbies. Usually, the least appealing rings are the thicker ones as well as the ones with straight edges. If you work a lot with your hands, tools, or seriously engage in sports, a simple ring with slightly rounded edges would be a wiser choice. They will help you choose the of the perfect wedding ring in a jewelry store. Try to bare in my mind to not try on the rings after a physical activity or during pregnancy, as fingers tend to get swollen. Also, cold fingers are thinner than warm. The goal is to find the optimum size that will make sure the ring does not drop from the finger and at the same time is not too tight. At Zlatarna Sterle they really made precise measurements and by their estimates I am a size 11 to 12. 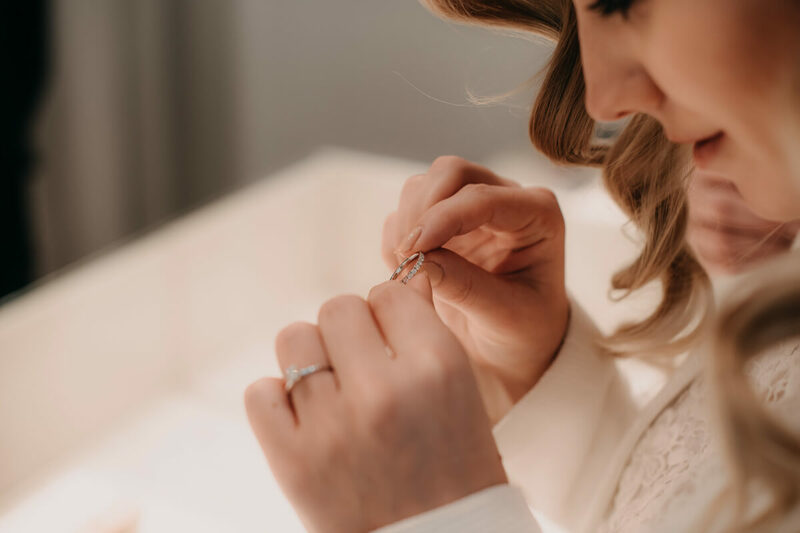 They also advise you to wear a ring for a while as soon as you get it and thus see if your size fits, to be able to make some slight modifications before the wedding if necessary. Matching a wedding ring of groom and bride – is it necessary? 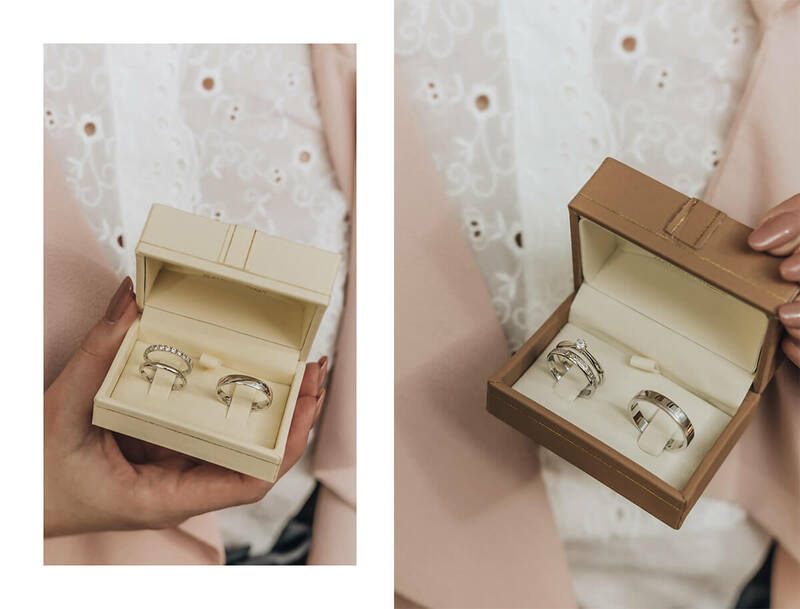 If you pass by jewelries, you’ll quickly realize that all wedding rings are put together in matching pairs – one for him and one for her. But this does not mean that they need to be bought together. I consider that the matching in terms of the same form and metal is beautiful, but not necessary. Myth or truth: if they hear the adjective “wedding” in the jewelry, the price is automatically higher. 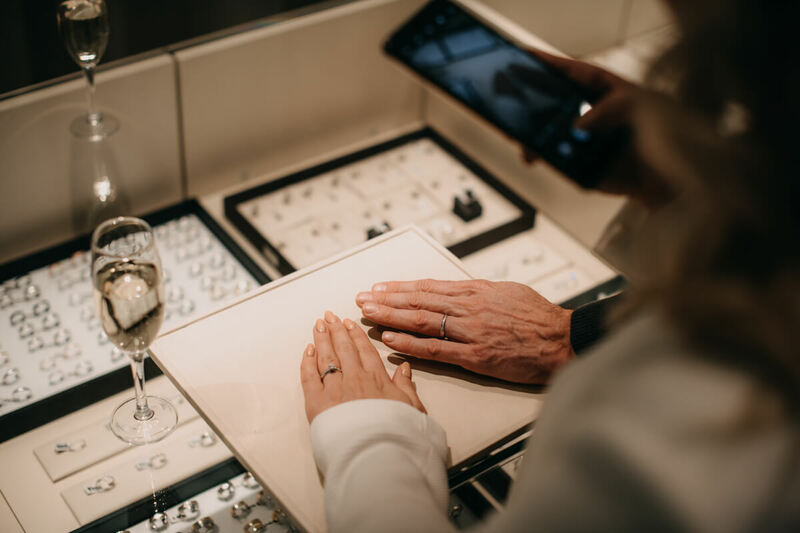 You’ve probably been warned before to go to the jewelry alone, trying to look as if you are searching for a anniversary ring or something similar (“To save money just don’t mention the wedding!“). 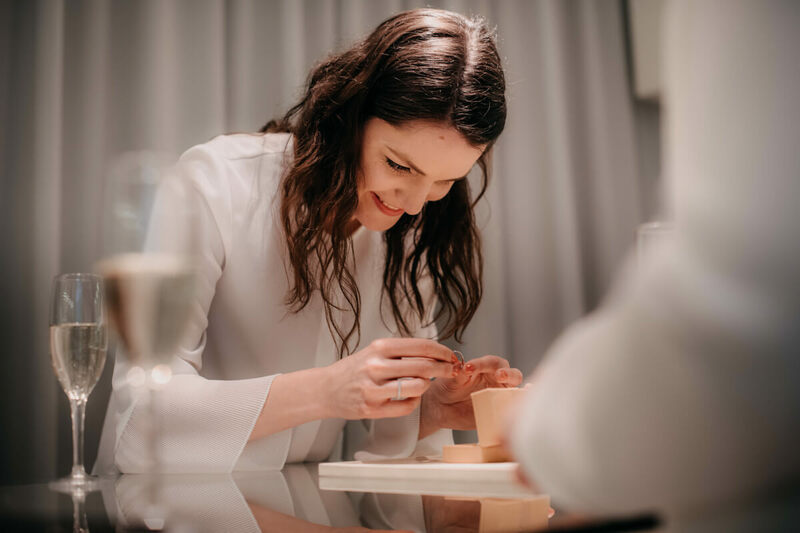 I checked this myth with Zlatarna Sterle and they’ve assured me that their rings are valued according to the materials used and the amount of hours spent on creating those rings. The basic rule is that platinum is more expensive than gold (x2! ), the price is higher with the number of carats of gold (usually it’s 14k), certainly a similar ring with real diamonds will cost you more (the quality of diamonds also rises the price). The thicker or heavier the ring, the more expensive it will be, because more material will be used. It will also be more expensive if your size is larger. The price may also vary according to the number of hours invested (especially when creating the unique ones), but often when paying a higher price, you pay the “brand name” on top of everything. 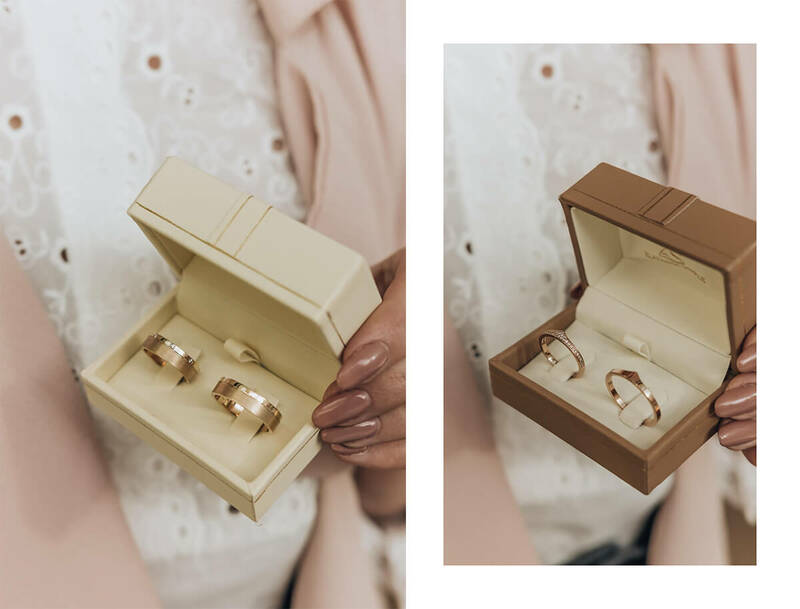 The approximate prices for most bridal sets (two rings together), for example, at Zlatarna Sterle range between 250 and 1000 eur (and maybe a lot more. 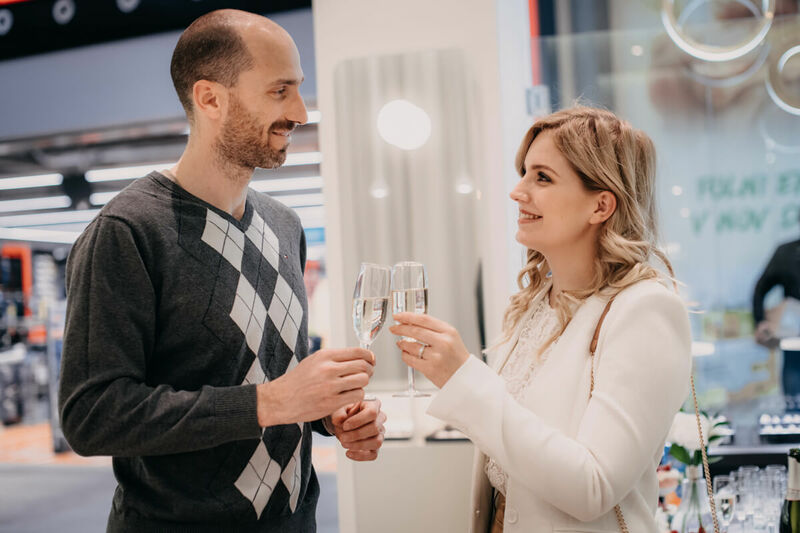 Most Slovenian couples are ready to deduct around 700 eur for the ring. Jan opted for a thinner, vintage choice that is considered more affordable (about 250€), and I chose one of the more expensive ones. Given the number, size and quality of diamonds, it was not expected that it would be cheap and in the end it exceeded the amount that most couple plan for two wedding rings. Diamonds in the size of 0.03 ct are arranged on two-thirds of the ring, only one third is empty. I do not know the exact number of diamonds (this will be estimated later on) so I do not even know the final price – it’s probably worth a thousand more than Jan’s ring. How much you’re willing to deduct for your rings is your personal decision. Bare in mind also that your rings need regular maintenance. 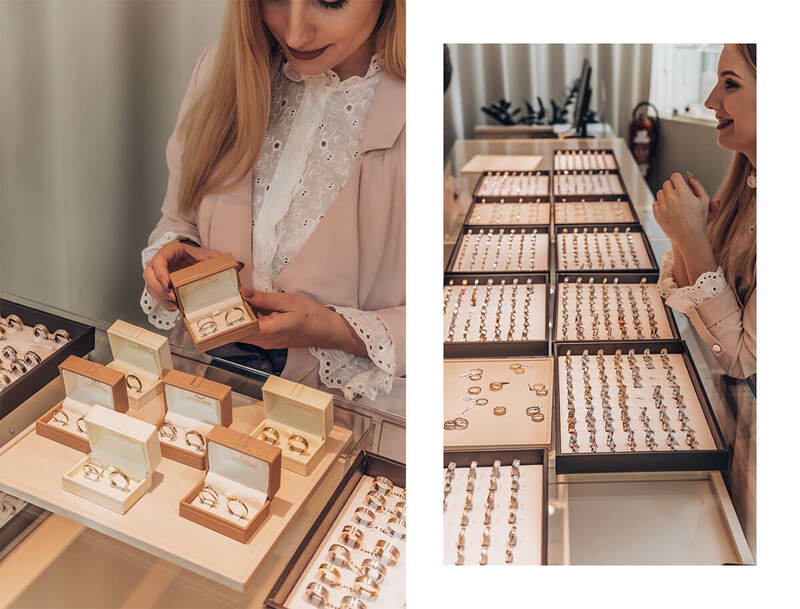 Rings purchased at Zlatarna Sterle have a lifelong warranty for free repair, cleaning and polishing. What to engrave on the inner side of the wedding ring? 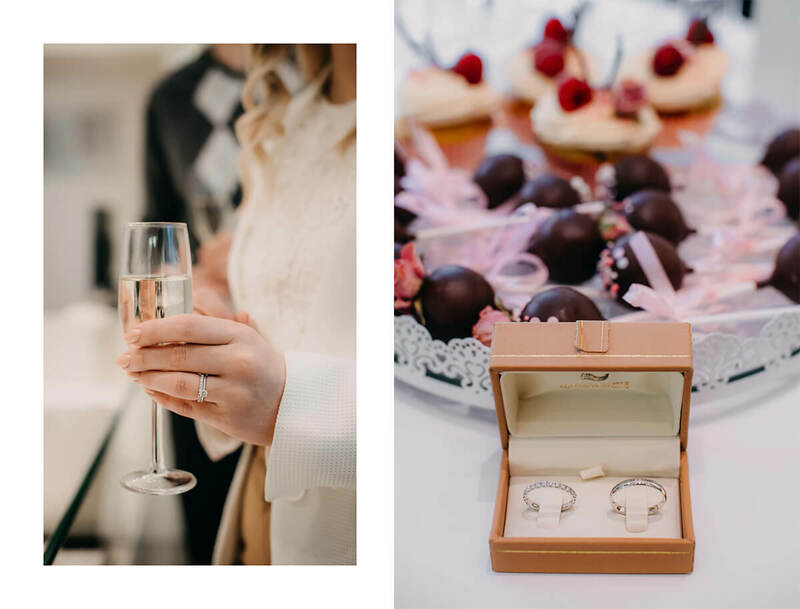 The decision is yours – these may be your names and surnames, the initials, the date of the wedding, the place of the wedding, a favorite quote, a sign (for example, infinity sign ∞ or a heart ♡), or you can even add a diamond or some other precious stone to the inside of the rings. It is also dependends whether the ring allows the engraving (which a full eternity ring unfortunately doesn’t), also be careful what thickness and width to choose to be able to do an inscription or engraving. My ring has less than 1/3 interior for engraving free (there are also stamps which indicate the quality of the material). So we decided to engrave on the inside of both of the rings J ∞ A and the date of our wedding. Enjoy your wedding planning choices. Take time, think about it, fall in love – with your partner as well as with your wedding decision. I most certainly fell in love with my wedding ring and can hardly wait for Jan to place it on my finger. Wedding dilemma: DJ or band?